Welcome to this year’s primary dealer meeting, and thank you for joining us today. As primary dealers, you play an integral role as the Federal Reserve’s counterparties in operations to implement monetary policy, as participants in U.S. Treasury auctions, and as important providers of information on market developments to support the Desk’s monitoring of financial markets.2 Today’s meeting provides us with a valuable opportunity to communicate our expectations for you as our counterparties and to strengthen our important relationship. Today, I’ll discuss the market for U.S. Treasury securities, with a focus on how the market’s structure has changed in recent years. As you all know, the U.S. Treasury market is one of the most important financial markets globally and is valued as a source of safety and liquidity. Indeed, both domestic and global investors, including private sector institutions, retail investors, and foreign central banks, hold Treasury securities at least in part for these reasons. A deep and liquid Treasury market also helps to underpin the U.S. dollar’s status as the global reserve currency. I’ll begin with an overview of the market’s basic structure, including some historical perspective on how that structure has evolved over time. I’ll then turn more specifically to the subject of electronic and automated trading—a topic that has become increasingly important across many markets, including the market for U.S. Treasuries. I will then review the intraday volatility witnessed on October 15 of last year. As you all know, October 15 was a highly unusual day in the Treasury market, particularly given the very sharp round-trip in yields that took place mid-morning with no obvious immediate trigger. I will conclude with a few words on the updated best practice recommendations from the Treasury Market Practices Group (TMPG) in light of the changing market structure, and some observations on how you, as primary dealers, are expected to help promote the market’s efficiency and integrity. As always, the views I express are mine alone and do not necessarily reflect those of the Federal Reserve Bank of New York or the Federal Reserve System. The Treasury market is the largest and most liquid sovereign debt market in the world. There are about $12.5 trillion in marketable securities outstanding, and primary dealers trade an average of around $500 billion every day with their clients and with other parties.3 Treasury securities play a variety of roles in the U.S. economy. They are, of course, the federal government’s primary vehicle for financing the federal deficit and refinancing maturing debt. Global investors use Treasuries for investing and hedging purposes, and as benchmarks for pricing other types of assets. In addition, many in the public and private sectors use Treasury yields to glean information about expectations for the future course of the U.S. and global economy. Treasury securities originate in the primary market, where the Federal Reserve Bank of New York, in its capacity as fiscal agent for the U.S. Treasury, works with primary dealers to facilitate the auction process.4 Auctions are open to primary dealers, their customers, and direct bidders. Higher federal deficits in the wake of the financial crisis required Treasury to increase the amount of issuance for some time, but the deficit has now shrunk to a level closer to historical norms, bringing the required level of additional issuance, also known as "net issuance," down in tandem.5 However, gross issuance, defined roughly as the sum of the issuance required to refinance maturing debt and the net issuance required to fund the existing deficit, continues to be very high by historical standards. For example, in 2014, the U.S. Treasury issued just over $630 billion on a net basis, whereas there was $7 trillion in total gross issuance taking place over the year. A deep and liquid secondary market, where traders buy and sell existing securities at an agreed-upon price, is a crucial attribute of the asset class, and primary dealers and other market participants also play an important role here. Strong liquidity in the secondary market facilitates smooth price discovery and ensures that investors can adjust their holdings of Treasury securities at minimal cost. The attractiveness of Treasury securities to investors, in turn, helps minimize the cost of issuance to the U.S. Treasury and facilitates the Federal Reserve’s ability to implement monetary policy. The secondary market for Treasury securities operates on an over-the-counter basis—that is, not on an exchange.6 Historically, secondary market trading has fallen into two categories: trades between dealers and customers, and trades between dealers. "Dealer-to-customer" trading consists of direct transactions between broker-dealers and end-investors, and trading activity tends to be dispersed across both the most recently issued securities, known as "on-the-run" issues, and seasoned securities, known as "off-the-run" issues. The outright purchases of Treasury securities that the Desk conducts to implement monetary policy would fall into the dealer-to-customer category. Much of the trading between dealers, on the other hand, takes place on platforms that provide opportunities for market makers to trade anonymously with each other, with a broker sitting in the middle. Activity taking place over these platforms is often referred to as the "interdealer" market, since dealers have been its traditional participants. The vast majority of trading in the interdealer market has also tended to concentrate in on-the-run issues, given—and likely contributing to—their superior liquidity. This liquidity advantage is reflected in the tendency for on-the-run securities to trade at a slightly lower yield than might be predicted by a theoretical yield curve—a concept often referred to as the "on-the-run premium." Another important change in the interdealer Treasury market relates to the issue of access. Until 1992, only primary dealers, as designated by the Federal Reserve Bank of New York, had direct access to the interdealer brokerage platforms.7 Owing partly to the advent of direct bidding in Treasury auctions and the effects of the Salomon Brothers bidding scandal the year before, the interdealer brokers expanded access beyond primary dealers to all entities who were netting members of the Government Securities Clearing Corporation (now the Fixed Income Clearing Corporation, or FICC). Over time, other entities also gained effective access to the platforms through their prime brokers, who themselves had direct access. In more recent years, interdealer brokers have granted access to an even wider range of participants, including participants outside the FICC netting membership. A third change is the availability of close substitutes to on-the-run Treasuries, which, as noted above, account for the great majority of trading in interdealer markets. Historically, on-the-run Treasuries had a limited number of close substitutes as a highly liquid, credit-risk-free, dollar-denominated fixed-income instrument. Today, however, dealers and investors can transact in a variety of instruments that closely resemble the risk and liquidity properties of on-the-run Treasuries, including Libor-based interest rate swaps and overnight index swaps. Moreover, Treasury futures, which have existed for several decades, have become an increasingly widely used close substitute as well. Throughout this history, the Treasury market has retained one of its most important attributes—its superior liquidity. However, the concept of financial market liquidity is a notoriously difficult one to define. Many approaches to measuring liquidity seek to quantify the cost of transacting in a given size, and this is certainly one reasonable definition. Others, however, might argue that it is the ability to transact that matters most for liquidity, even if the "cost" goes up during periods of heightened volatility. Perhaps even more difficult than defining liquidity is answering the question of how an increasingly electronic, and often automated, market affects liquidity. As we will see, this is a particularly pertinent question when examining the events that took place in the Treasury market on October 15 of last year. As I noted earlier, electronic trading—or the practice of executing transactions through computer systems—has become an important feature of the modern Treasury market. While comprehensive data on the universe of secondary trading in the Treasury market is somewhat lacking, estimates suggest that electronic trading represents a greater share of activity than transactions conducted by voice, perhaps by a substantial margin. As noted above, the vast majority of interdealer market trading is conducted electronically, but a sizable proportion of trading in the dealer-to-customer market is now executed electronically as well. Automated trading is a subset of electronic trading that relies on computer algorithms for trading decisions, execution, and booking. Market participants engage in automated trading for a variety of reasons, including cost savings and efficiency gains from the relatively faster speed at which computer algorithms can make and process certain types of decisions. For example, a dealer may decide that for orders under a certain size, it is more efficient and cost effective to have a system automatically provide a quote when a customer shows interest than to have a trader manually do so. High-frequency trading (HFT) refers to a type of automated trading that relies primarily on speed to identify and act upon trading opportunities faster than other market participants. HFT is often associated with a high volume of order messages and rapid position turnover. Such trading typically requires a significant investment in technology and communications systems designed to reduce the amount of time necessary to transmit and process information. Although high-frequency trading has garnered much attention in the media, it is worth pointing out that distinguishing between "automated trading" and "high-frequency trading" is not clear cut. In fact, many features ascribed to high-frequency trading, such as minimizing the time between trading decisions and execution, also apply to automated trading more broadly. Automated trading is conducted by a range of different firms, including broker-dealers and specialized proprietary trading firms that trade without client money. Firms specializing in automated trading generally participate in trading venues with "protocols" that allow for high-speed activity, most notably those operating with a Central Limit Order Book (or "CLOB"). CLOBs have long been a fixture of the futures, FX, and equity markets, and allow participating firms to place anonymous orders to buy or sell securities into a standing queue, and to rapidly execute such orders at any given moment in time.8 In the Treasury market, automated trading has become most pronounced in the Treasury futures market and the interdealer market for on-the-run securities, both of which operate with a CLOB protocol. In fact, proprietary automated trading firms are believed to account for over half of the volume transacted over the major interdealer trading platforms. One important difference between most automated trading firms and traditional broker-dealers is their balance sheet properties. Traditional broker-dealers generally carry net long or short positions in Treasury securities from one day to another, an activity that requires capital. Dealers hold Treasuries for a variety of reasons, including to support the liquidity needs of their customers, to hedge exposure in other fixed-income products, and to meet their obligations as primary dealers to participate in U.S. Treasury auctions and the Federal Reserve’s open market operations. Many argue that the ability and willingness of dealers to deploy their balance sheets for holding Treasury securities and other fixed-income assets allows them to serve as shock absorbers, particularly during times of volatility. Automated trading firms, on the other hand, typically do not end the day with significant long or short net exposure, despite the fact that they often conduct a substantial volume of gross transactions.10 As a result, automated trading firms do not face the same level of capital constraints under the traditional way of thinking about capital requirements.11However, for the same reason, they also may not be capable of serving as shock absorbers during periods of heightened volatility, as traditional market makers are thought to do. Thus, while the market may have come to rely on automated trading firms as suppliers of very-short-term intraday liquidity, market participants still rely on traditional market makers with balance sheet capacity to supply liquidity over longer-term horizons. Electronic trading, including automated and high-frequency trading, has likely had a number of benefits. For one, technological advances have supported market efficiency by increasing the pace at which price discovery is disseminated across financial markets. It may also have reduced transaction costs, both through the economies of scale that large technology investments produce, and perhaps through the maintenance of narrow bid-offer spreads that automated market-making arguably makes more likely. For example, automated market-making might allow an investor to instantaneously transact in a security at a visible price, with the market maker then able to immediately offset the risk by automatically hedging the exposure. Electronic and automated trading has also introduced risks to the Treasury market, as it has with other markets. For example, in the case of automated or high-frequency trading, firms must have sufficient internal controls to handle erroneous data and prevent malfunctioning algorithms. Considering that automated trading firms may hold limited amounts of capital given their minimal levels of net long or short exposure, some firms may be particularly vulnerable in the event of such an error. We have already seen some of these risks manifest themselves in foreign exchange and equity markets, where electronic trading is even more common. Further study is required to understand the particular nature of such risks in the Treasury market and the implications that may exist for other institutions, particularly since many automated trading firms are not direct netting members of FICC. Automated trading has also raised questions on issues related to fairness and market behavior. For example, there is likely some dispersion across firms with respect to the speed at which they can transact, which in turn could lead to dispersion in the quality of execution that market makers and end-investors are able to achieve. This is an important topic for examination and reflection, but it is also worth remembering that a varied level of technological access has long been a feature of competitive financial markets. For example, when the telegraph appeared in the first half of the nineteenth century, traders without immediate access cried foul when early users began leveraging the technology to minimize the time between trade decisions and execution. Electronic and algorithmic trading also has the potential to facilitate trading practices that are not helpful to market liquidity. For example, submitting a quote with the intent to cancel it before any reasonable probability of execution is detrimental to the quality of market liquidity and to the integrity of the market. Even if such acts are not intentionally misleading, they can still result in a false sense of market liquidity. Finally, firms employing high volume automated trading strategies could harm market liquidity if they do not manage those strategies carefully, particularly given the significant share of market activity they represent. As I will explain later, the Treasury Market Practices Group has updated its best practices to emphasize the importance of supporting market liquidity as well as avoiding automated trading strategies that create a false impression of market price, depth, or liquidity. In conjunction with those best practices, the TMPG also released a white paper on automated trading that reviews several categories of associated risk, including operational risk, potential systemic counterparty risk, market manipulation risk, and transmission risk. Let me now turn to the unusual events of October 15. On that day, Treasury yields exhibited extreme volatility, with the benchmark ten-year yield trading in a range of about 35 basis points between the market open and close. This included a sharp decline in yields following the U.S. retail sales report at 8:30 ET that morning, and a highly unusual round-trip in yields just after 9:33 a.m. At that time, the ten-year yield fell about 15 basis points in a five-minute period, before nearly fully retracing that move in roughly the same increment of time. That very short "event window" was a remarkable occurrence in one of the world’s most liquid markets, and likely reflected a unique dynamic on what was already an unusual day. Indeed, the net change on the session as a whole was less than 10 basis points—a small fraction of the extraordinary intraday range that we are still discussing today (see the chart). Historical examples of sharp intraday changes in U.S interest rates have tended to be associated with important economic events, such as major monetary policy announcements. There does not yet appear to be consensus by market participants around a single cause of the volatility on October 15. To be sure, a number of factors likely contributed, including concerns about the global macroeconomic outlook and the unwinding of positions by leveraged investors. Indeed, such concerns probably help explain why a modest surprise in U.S. retail sales could trigger such a strong reaction around 8:30. Publically available positioning data in the futures market does indicate that investors who take positions for purposes other than hedging had accumulated a large base of short positions in shorter-term interest rate futures contracts over the preceding months, and that that aggregate position unwound sharply in the weeks around October 15. Yet these factors are less convincing as explanations of the round-trip in yields witnessed more than an hour after the data release. Activity in this event window also appears unconnected to any other piece of incoming information. As a result, many market participants and members of the official sector have questioned whether recent changes in the structure of the Treasury market can help explain the move, and some have focused on the potential role of electronic and automated trading. Clearly automated trading likely played an important role in the speed of transmission of price movements from the Treasury market to other markets, since such technology allows investors to quickly identify and execute trades that are predicated on tight linkages between different markets. At the same time, some have suggested that firms engaging in automated trading may have "unplugged" their systems or carried out strategies that prompted or exacerbated the volatility. To be sure, the response of firms relying heavily on automated trading strategies to market volatility may be different than that of non-automated participants, given the ability of automated systems to rapidly adjust their risk exposure in response to evolving order book and market price dynamics. However, a wholesale retreat on October 15 is inconsistent with the extraordinarily high trading volumes observed throughout the day, and the continuous nature of trading that occurred even during the most volatile periods. Indeed, some past periods of very sharp changes in financial asset prices have been characterized by prices "gapping" from one point to another, with little trading in between. But this appears not to have been the case on October 15. Even so, it is possible that changes in the participation or behavior of firms employing automated strategies—including broker-dealers and proprietary trading firms—had an effect on market liquidity and price movements that day, even if there was no wholesale disengagement. Others have suggested that the event window on October 15 is a byproduct of regulatory changes that have reduced traditional dealers’ ability to serve as shock absorbers during periods of volatility by accommodating large net order flows. In particular, some market participants argue that recent regulatory changes have increased the cost that dealers face when expanding their balance sheets, leaving them less willing to do so for relatively low-margin businesses, such as making markets in Treasury securities. If true, it may help explain how an unwinding of large positions, as may have been observed in the sixty minutes after retail sales on October 15, could have had such a large impact on yields. But it is far from clear that such changes, on their own, can explain the round-trip in prices during the event window itself. That said, it is possible that the dominance of electronic and automated trading and the changing composition of participants in the Treasury market have interacted with changes to dealer behavior—whether the result of regulatory incentives or other reasons—in a manner that makes unusual intraday price moves more probable. While it is precisely the intention of many recent regulatory initiatives to ensure that financial firms hold sufficient capital to support the size of their balance sheets and risk taking activities, there could be unintended consequences of these regulatory changes, including the possibility that sharp intraday price moves become more common. 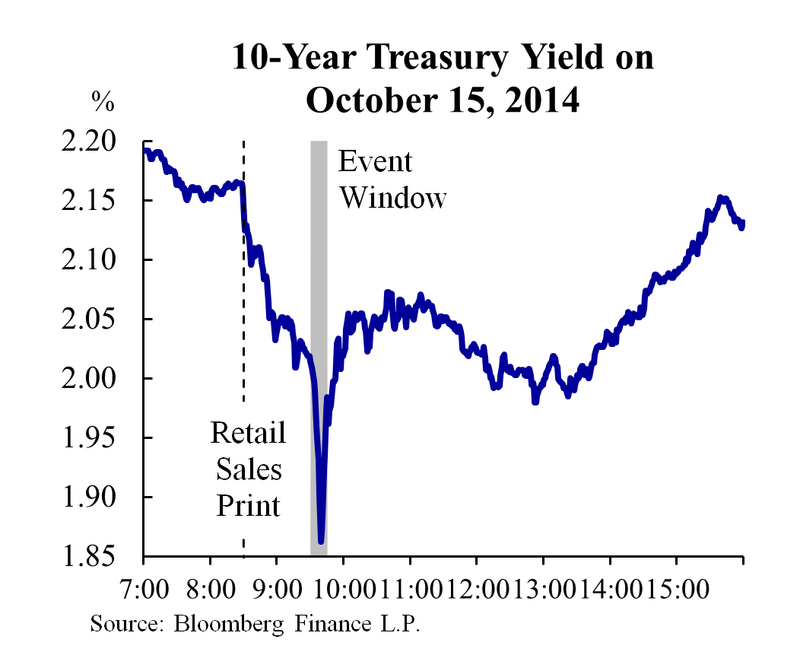 October 15 also raises questions about the nature of liquidity in the Treasury market today. As I mentioned earlier, market liquidity is a difficult concept to pin down, and if one asks how liquidity evolved on October 15, the answer will differ depending on the measure of market liquidity you have in mind. It is certainly the case that some frequently-cited metrics of liquidity, such as the quantity of orders available for execution in the CLOB at a given point in time, often referred to as "market depth," showed significant signs of strain that morning. But volatility was also elevated, so a coincident reduction in market depth may be unsurprising. Indeed, an increase in volatility and reduction in depth can work in a self-reinforcing manner, in which reduced depth causes trades to have a greater price impact, while the resultant volatility causes market depth to shrink further. This dynamic has always existed in markets, but it is possible that automated trading serves to exacerbate it in certain situations. But even if a sharp reduction in market depth makes sense given an increase in volatility, a trade of reasonable size would have been more expensive for a customer to execute in the event window, and would have had a greater price impact, than in more normal conditions. In this sense, liquidity was challenged, and frequent periods of strained liquidity would be undesirable for the most liquid sovereign debt market in the world. Others might argue that liquidity on October 15 was reasonable, because the ability to transact, albeit in smaller than usual sizes, appears to have been there, even in the most volatile times. As previously noted, trading volumes were many times their normal levels during that morning, and trading took place on a continuous basis. If liquidity had really deteriorated so significantly, it may be unlikely that such extraordinary flows would have been possible. That being said, the simple ability to transact does not necessarily equate to strong liquidity, particularly if transacting is only realistic in a relatively small size, or if it is only possible to conduct a trade of reasonable size by "paying" a significant spread to the midpoint of the best bid and offer. Regardless of one’s definition of liquidity, recurring periods of heightened and unexplained volatility – especially if prompted by little new information, as with the event window on October 15—could prompt end-investors and market makers to question the superior liquidity of the Treasury market and perhaps hamper the critical roles the market serves. The Treasury market serves as a liquid investment option for global investors, a ready source of collateral for other financial transactions, a benchmark for pricing other securities, an important component of the Federal Reserve’s framework for implementing monetary policy, and a market for financing the government that determines borrowing costs to the taxpayer. Given these critical roles and the risks posed by periods of sharp volatility, understanding the manner in which the evolving market structure is affecting market liquidity, efficiency, and price dynamics is of the utmost importance, and something we plan to study further. The Treasury Market Practices Group (TMPG) recently released a consultative white paper that addresses the effects of ongoing changes in automated trading on the structure of the Treasury market. This study was well under way before October 15, but it includes some preliminary observations from the TMPG on that event as well. The TMPG is a group of market professionals, sponsored by the New York Fed, committed to supporting the integrity and efficiency of the Treasury, agency debt, and agency mortgage-backed securities markets. The group has released a wide range of best practices for these markets, including a fails charge that resulted in a dramatic decline in delivery fails in Treasury securities and agency MBS, and the recommendation to margin forward agency MBS trades, a practice that now covers most bi-lateral forward trades in that asset class. The TMPG white paper on automated trading in the Treasury market includes an updated set of best practice recommendations that provide additional guidance for firms and trading venues involved with electronic and automated trading. Some of the changes to the best practices have to do with improving governance and back-office processes to keep pace with technological advancements. For example, the recommendations include maintaining better change control processes for designing, testing, and introducing trading technologies and algorithms. Additionally, they emphasize the importance of ensuring that risk management, clearing, and settlement processes are robust to challenges presented by the speed, sophistication, and potentially large gross trading volume associated with very rapid execution. The updated best practices also emphasize the importance of avoiding automated trading strategies that create a false impression of market price, depth, or liquidity. While the possibility of such trading practices has always existed, electronic trading provides more efficient tools for this type of behavior, and might also give some participants the false impression that it is easier to hide such behavior. Finally, the enhanced best practice guidance recommends that market participants who represent a material share of daily trading consider the impact on market liquidity before making abrupt changes to automated systems or trading strategies. This last recommendation is an important addition to an existing best practice that calls for market participants to manage large positions with care. Whether a firm has a large position, or represents a sizeable share of market activity, it has the responsibility to help support market functioning and liquidity. Making significant changes to either such a position or trading activity could disrupt market functioning and liquidity if not done with care, and the TMPG calls for such positions and activity to be managed with particular vigilance. I would like to thank the TMPG for its continued excellent work in improving market practices. Once the consultative period has concluded and the best practices are finalized, the TMPG calls for all participants in the Treasury, agency debt, and agency MBS markets to adopt these business practices. As primary dealers, you are, of course, also expected to implement these best practices. We also expect you to be good citizens of the Treasury market more broadly, and to be proactive in identifying worrying trends or suggesting further enhancements to these best practices as the market evolves further. You play a critical and central role in ensuring that the Treasury market remains a robust and efficient fixture of the global financial landscape. 1 I would like to thank Michael McMorrow for his excellent assistance in the preparation of these remarks and colleagues in the Federal Reserve System for numerous insightful comments and suggestions. 2 The "Desk" refers to the Federal Reserve Bank of New York’s trading desk, which implements monetary policy on behalf of the Federal Reserve System, as directed by the Federal Open Market Committee. 3 This figure is based on recent volume trends in the Federal Reserve’s FR2004 database. This figure is not adjusted for double-counting issues that arise from primary dealers reporting transactions with other primary dealers. FR2004 also represents an incomplete picture of liquidity provision in the Treasury market, as it only captures activity conducted by primary dealers. 4 At each Treasury auction, primary dealers are currently required to submit, at a minimum, their equally weighted share of the auction’s total offering size to ensure coverage. This is known as the “pro rata requirement.” In the past, dealers were required to account for 1 percent of secondary trading, but this requirement no longer exists. 5 The level of net marketable debt issuance is also affected by the Treasury’s need to borrow for student loans and other credit programs. The Congressional Budget Office currently projects such additional borrowing to average $61 billion annually over the next ten years. 6 Interestingly, Treasury bonds were traded on the New York Stock Exchange during the late 1910s and early 1920s, as the market grew with wartime financing needs. However, trading migrated to an over-the-counter market in the first half of the 1920s, in part because institutional investors, who were becoming an increasingly important part of the Treasury’s investor base, found it a more efficient means of transferring risk. 7 Although this was market practice through 1992, the Federal Reserve Bank of New York neither encouraged nor required this use of the primary dealer list. 8 A CLOB protocol aggregates all executable bids and offers across participating liquidity providers in a single order book that is available to all market participants. In a liquid market, the continuous visibility of quotes and the interaction of multiple bids and offers are likely to enhance the price discovery process and market transparency. In contrast, a request-for-quote protocol, where a request for liquidity typically is submitted to only a limited set of providers, by its nature imposes a degree of market segmentation that may impede the price discovery process as compared with a CLOB protocol, but is arguably better suited to handle large block trades and illiquid securities. 9 Momentum detection is a strategy that attempts to predict short-run price changes based on patterns in real-time market data. Statistical arbitrage is a trading strategy that typically relies on identifying mean reversion from historical relative pricing relationships between correlated assets. Spread trading seeks to profit from a simultaneous purchase and sale of two closely related fixed-income assets. 10 It is worth noting that the practice of trading with the intention of holding a position for a brief period of time is not new. For example, pit trading in the futures exchange featured traders who would look to earn spreads by holding positions for short periods of time and rarely overnight—similar in many ways to the practices of modern automated trading firms. 11 This raises the question of whether such firms are systematically capturing intraday exposures in their risk management systems. To the extent this remains a vulnerability, firms might consider near-term fixes they could put in place to insulate themselves from potential intraday losses.